See is worth a look (humor) and a ski day. 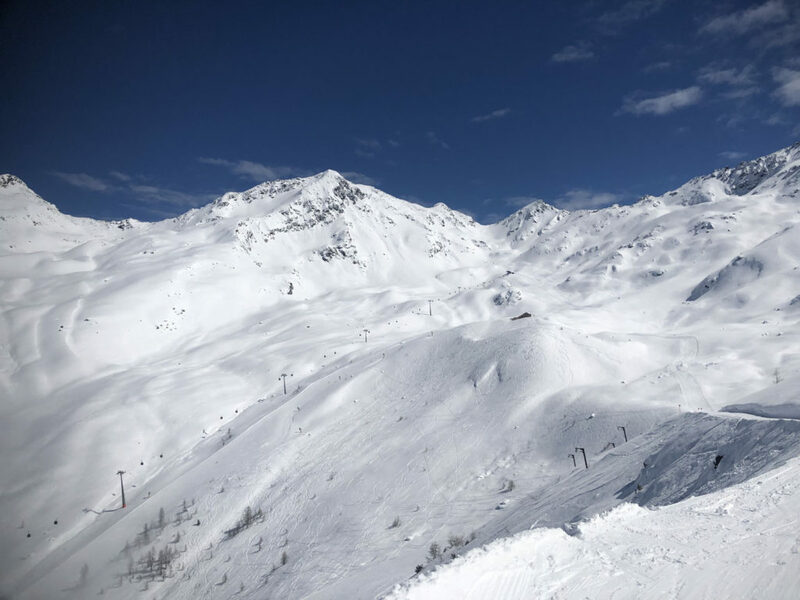 seriously See is the name of a small ski area in the large Paznaun region that includes Ischgl, Galtȕr, and Kappl. 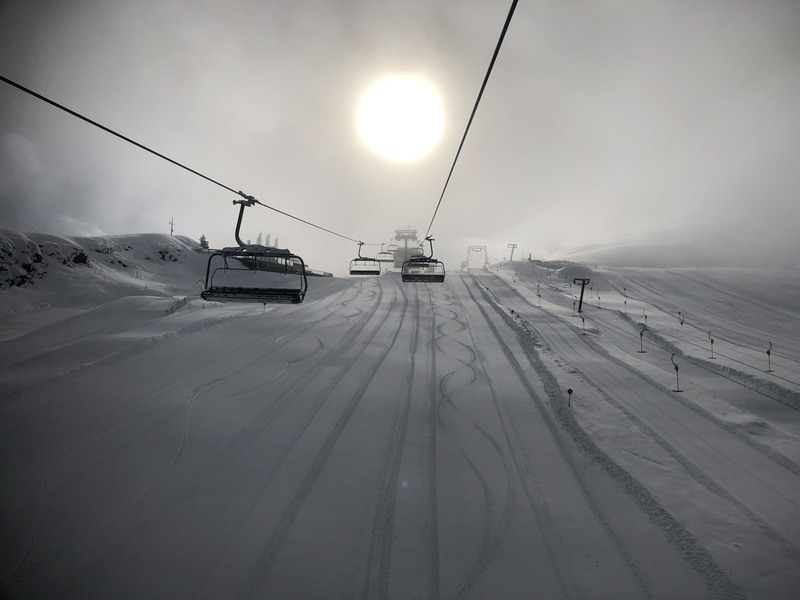 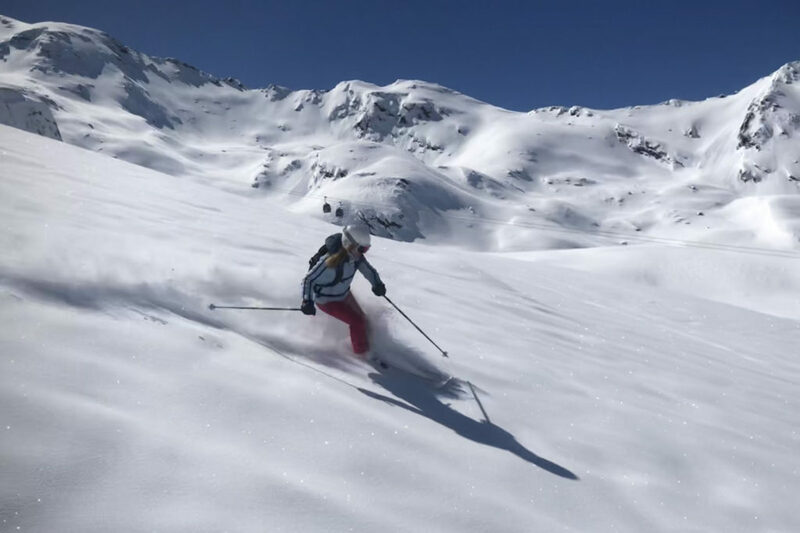 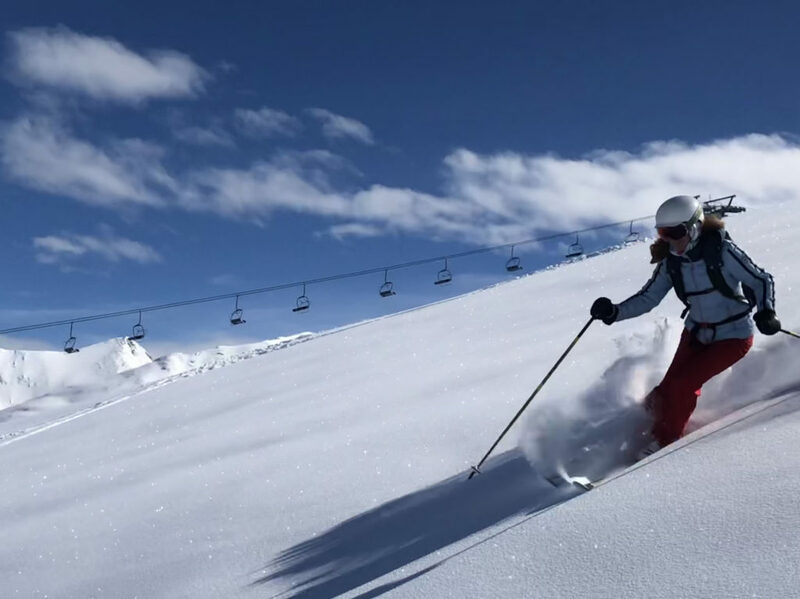 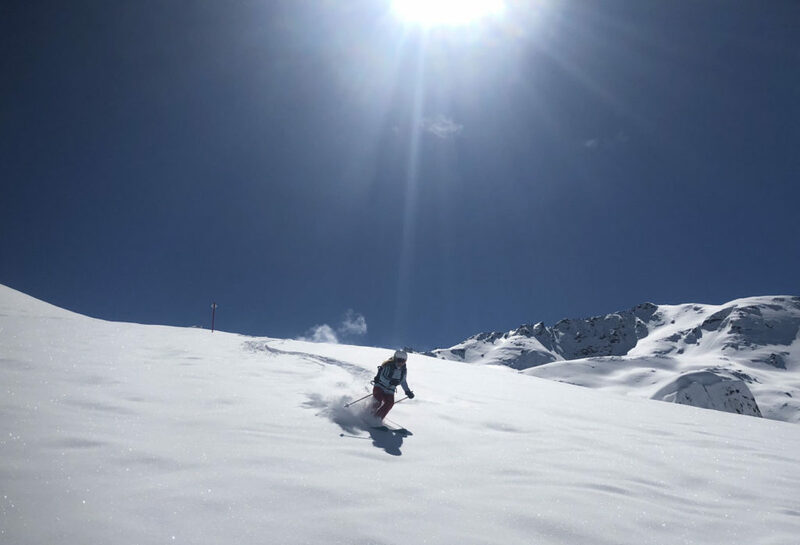 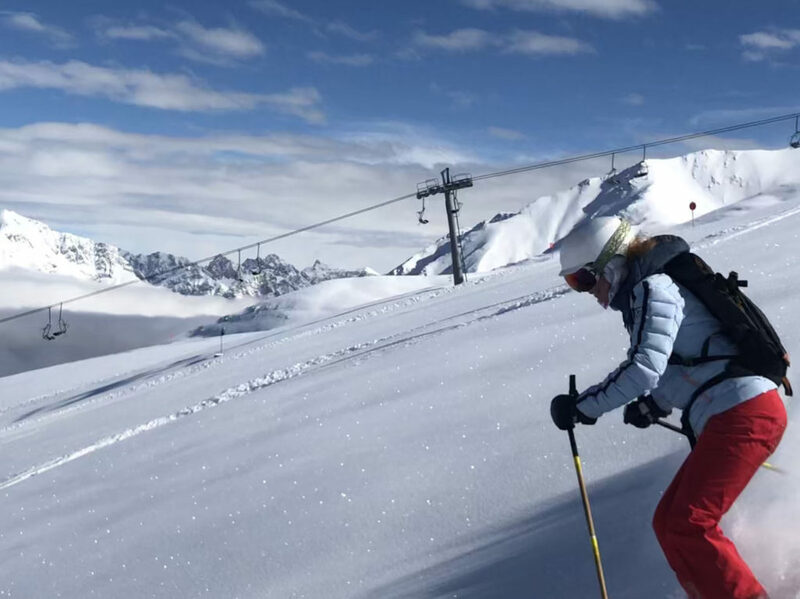 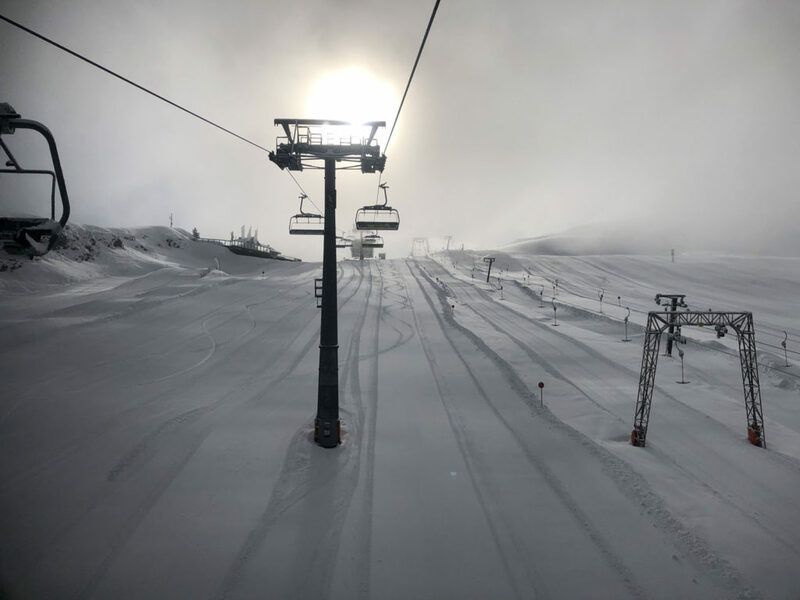 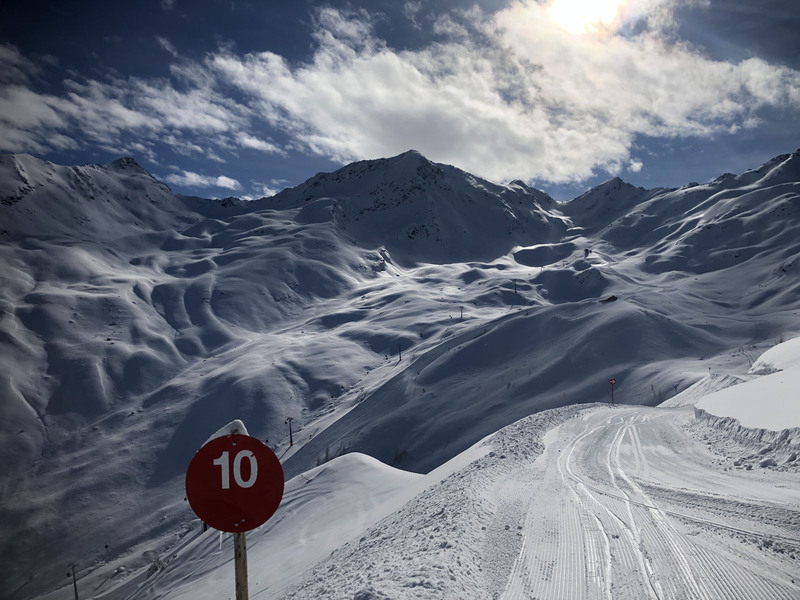 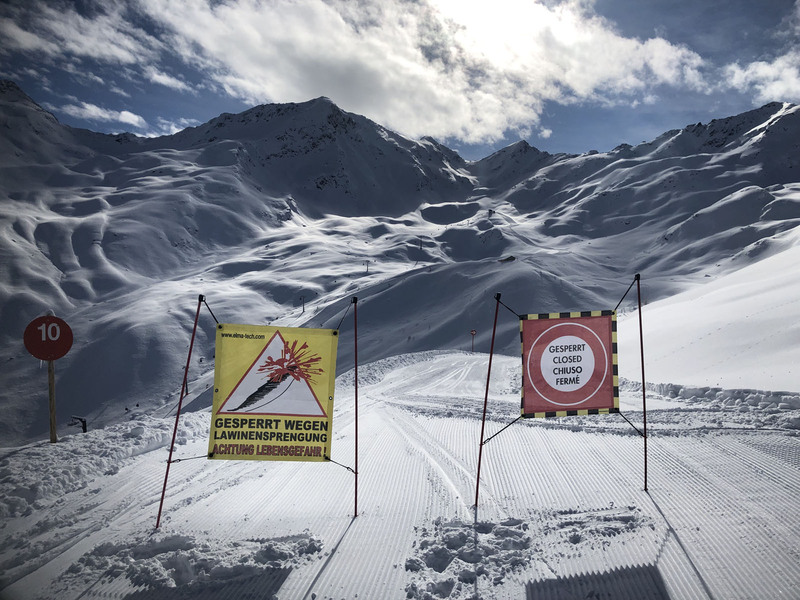 See is ideal for families, smaller in size than the massive modern ski resort of Ischgl, See has well-groomed ski pistes, and makes for a very pleasant day ski area for families, and its super fun on a powder day for free skiers. 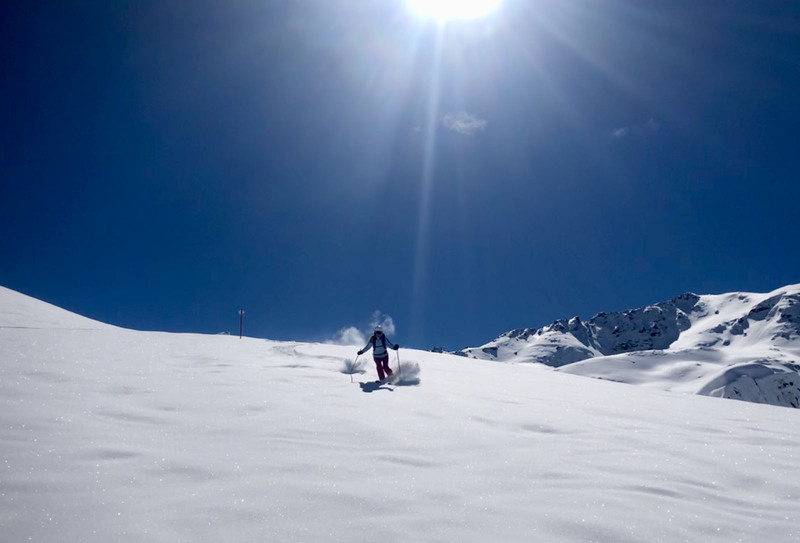 We scored a powder day here and it was amazing. 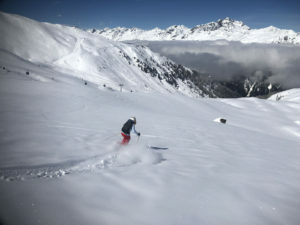 See ski tickets are good value as well, lift passes under $50 Euro, and they offer family ski ticket deals. 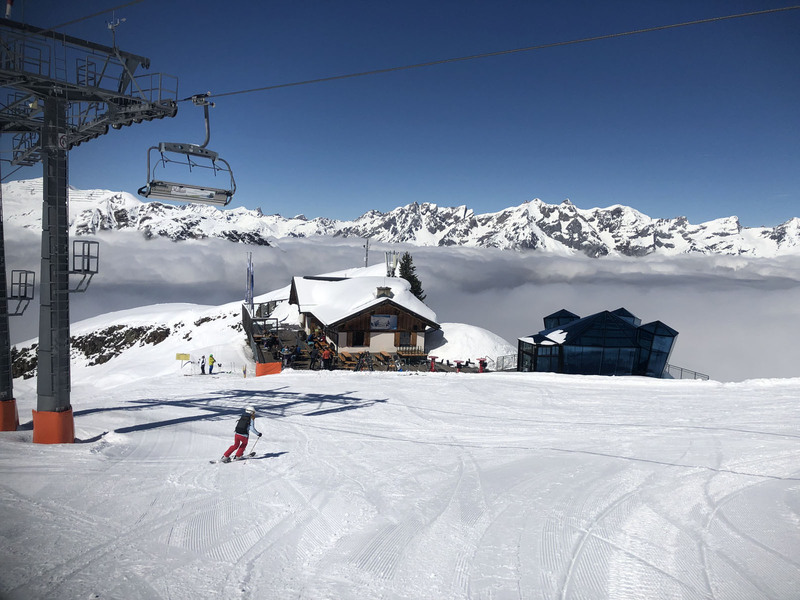 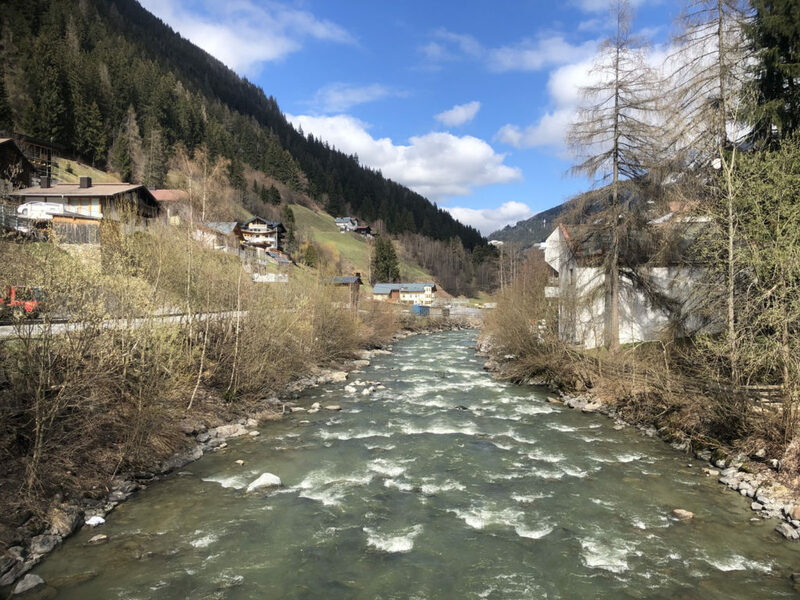 From See’s modest pretty alpine village, in Austria’s beautiful mountainous Paznaun valley, the long Medrigjoch gondola lifts you up from the free parking area to a high plateau where you find the ski area. 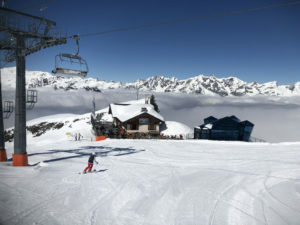 A six passenger chair serves the central part of the mountain, with half a dozen well-groomed, well-pitched ski runs. 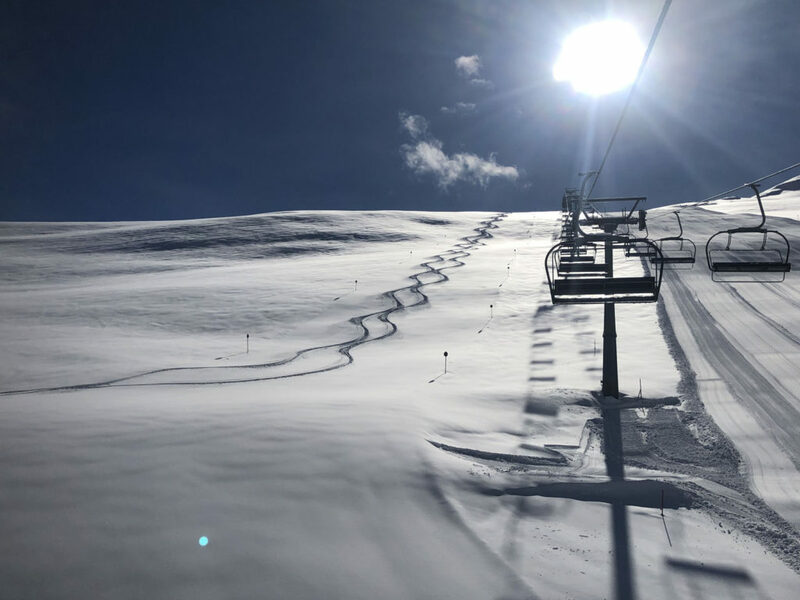 Most of See’s terrain is moderately pitched with the steepest trail connecting the west to the eastern side of mountain where you will find a lovely long gondola. 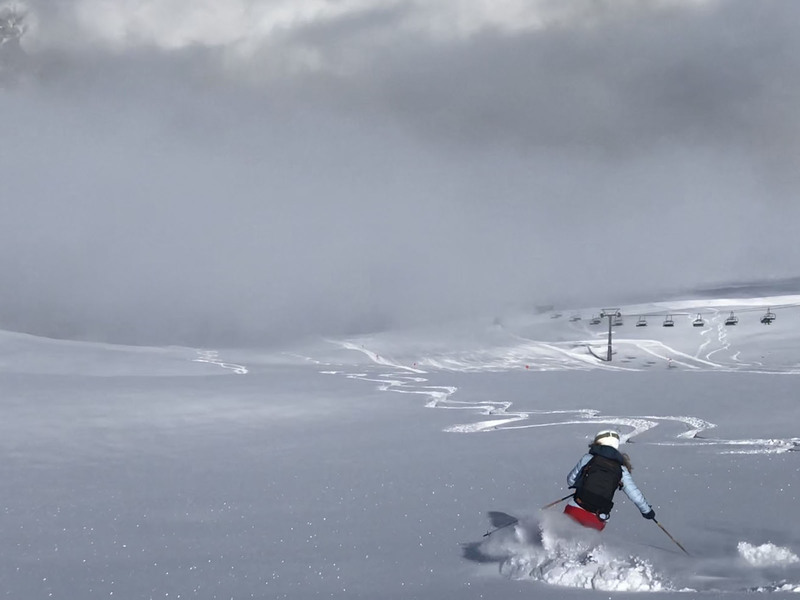 There is a snow park and terrain park right under the first chairlift for great viewing, or showing off your talents. 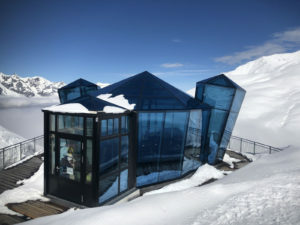 A scenic wood chalet restaurant at See’s summit offers grand sun terrace, and the very cool modern “Sky Bar” – a glass modular looking lounge for drinks with spectacular blue window panes and views in every direction at 2,200 meter. It’s incongruous to have an old fashioned wooden chalet next to this angular mod iridescent structure, but this “old meets new” works. 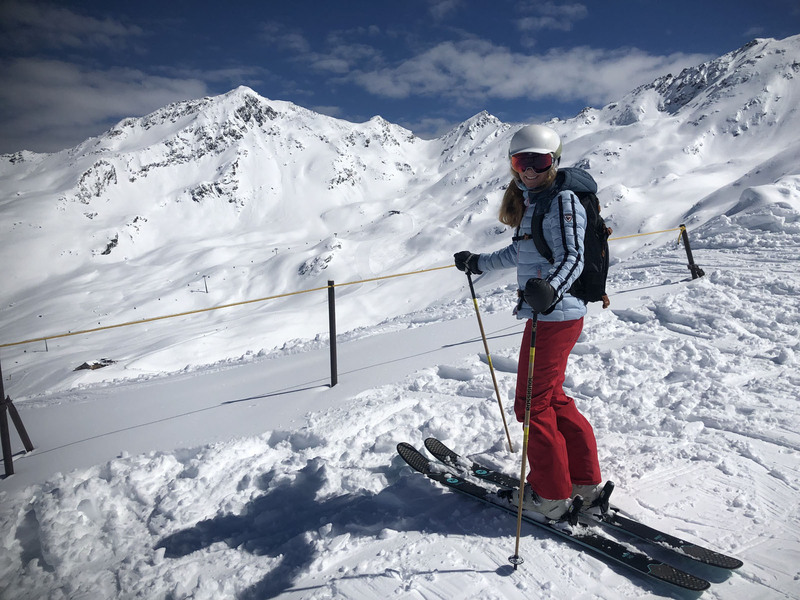 You can “see” See in all direction from this spectacular vantage, and ski in all directions too. From Rauhkopflift summit, skiers left, you head to the Rossmoos quad to find a few well-groomed long beautiful trails, and tremendous off-piste opportunity right next to the trails. 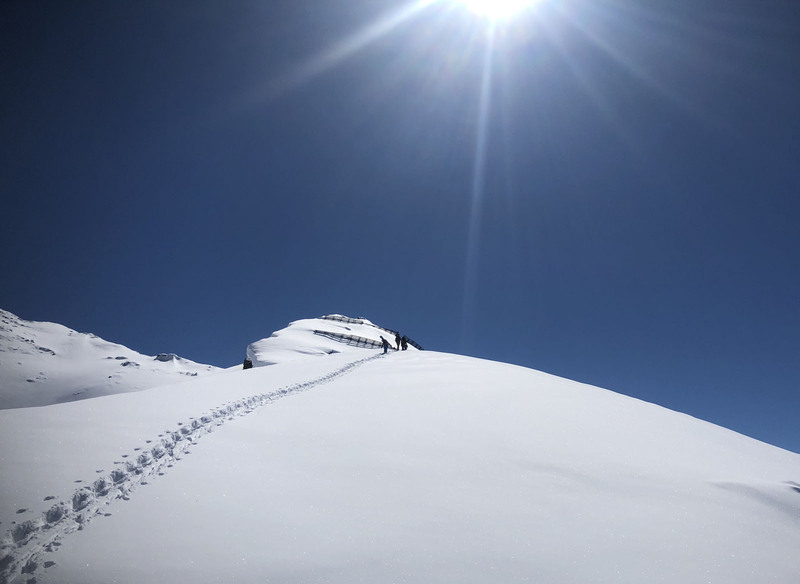 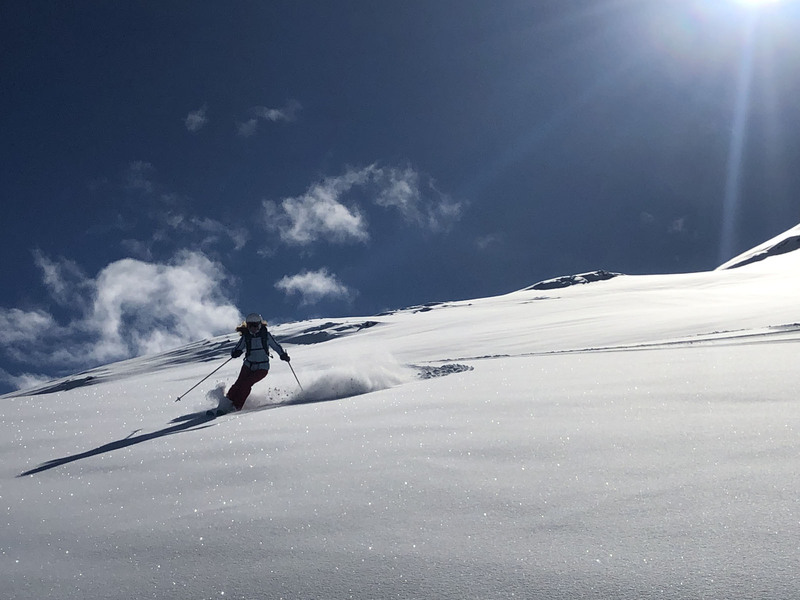 On our fresh snow day, in early April, we were 2 of about 12 skiers scoring run after run of fresh untracked powder – with no climbing, easily reached just off the prepared marked trails. 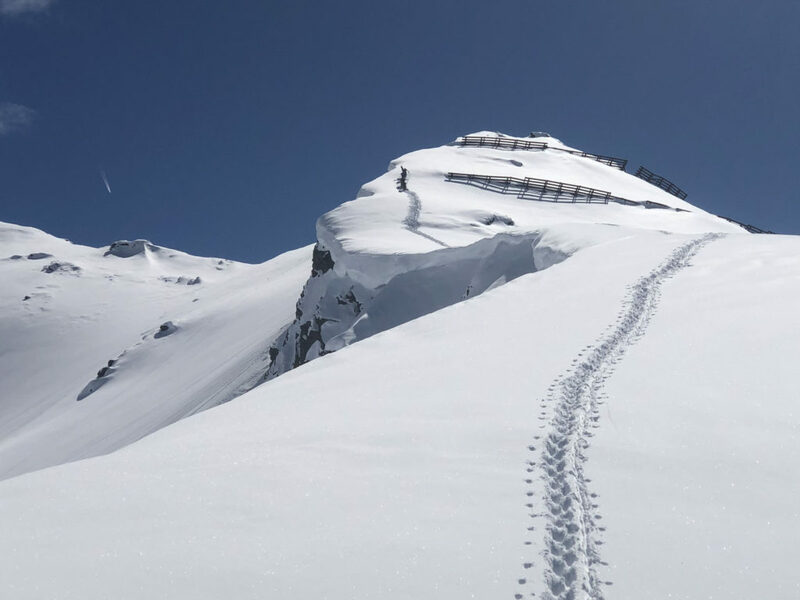 Auterhuttenkessel is famed among local free-riders and adventurers equipped with avalanche equipment, backpacks with pieps, probes and shovels. 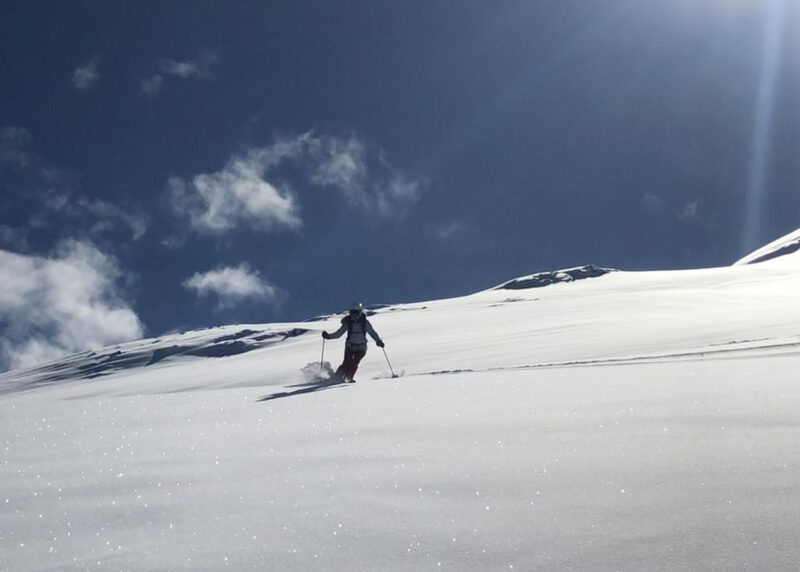 You should hire a guide to explore the off-piste safely, a bergfurer – mountain guide who knows where to go. 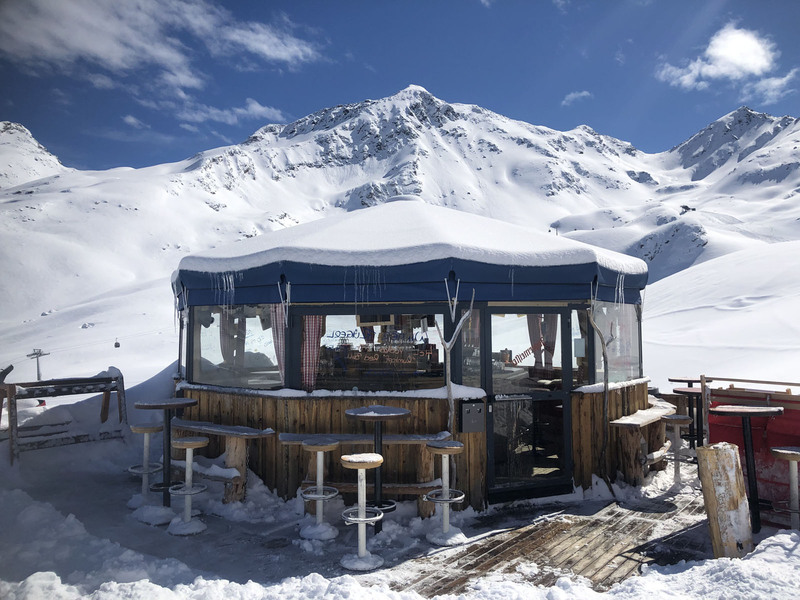 This is farm pasture in summer where cows graze and the product of delicious local Paznaun cheese is cultivated in the cheese huts, so be wary of hidden covered farm fences in the snow fields. 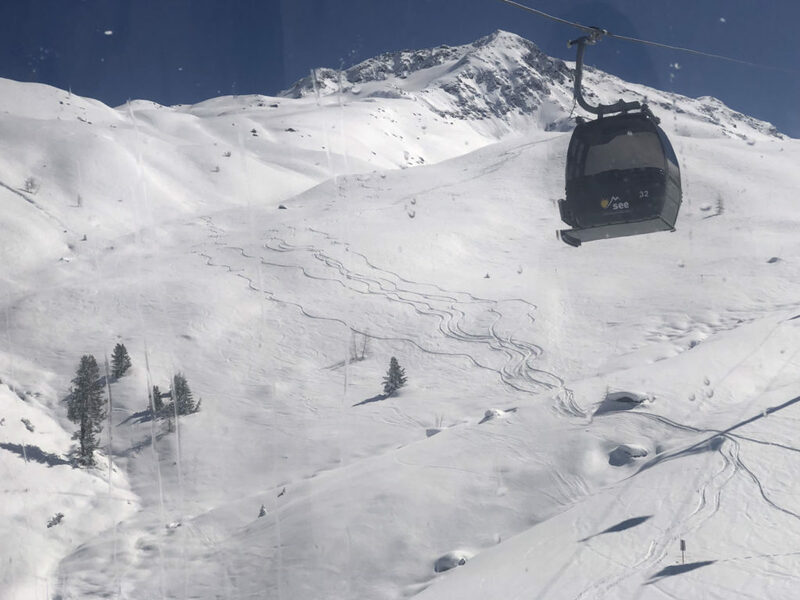 See’s Versing area is a sunny bowl to skiers’ right served by a modern 8-person Gondola. 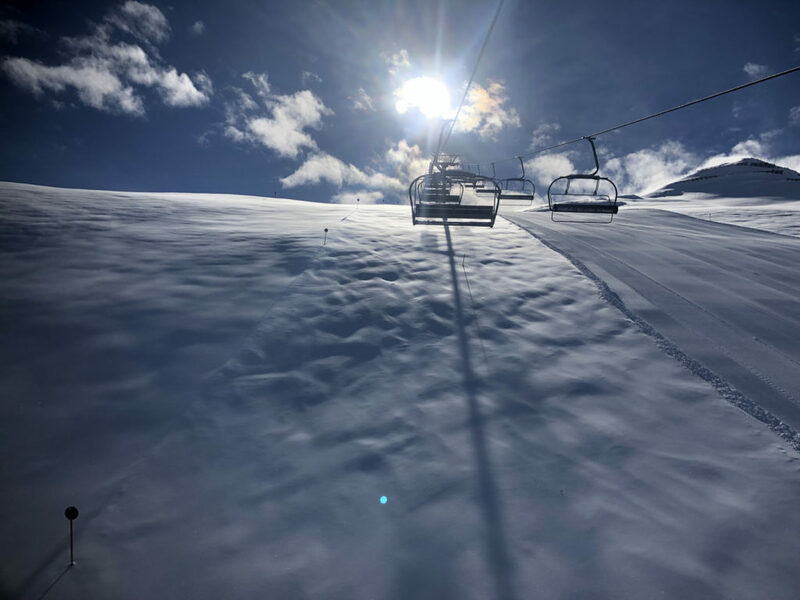 This big open bowl is not steep, its undulating and fun with two marked trails plus one ungroomed marked “ski route” plus lots of off-piste within view of the gondola and trails. 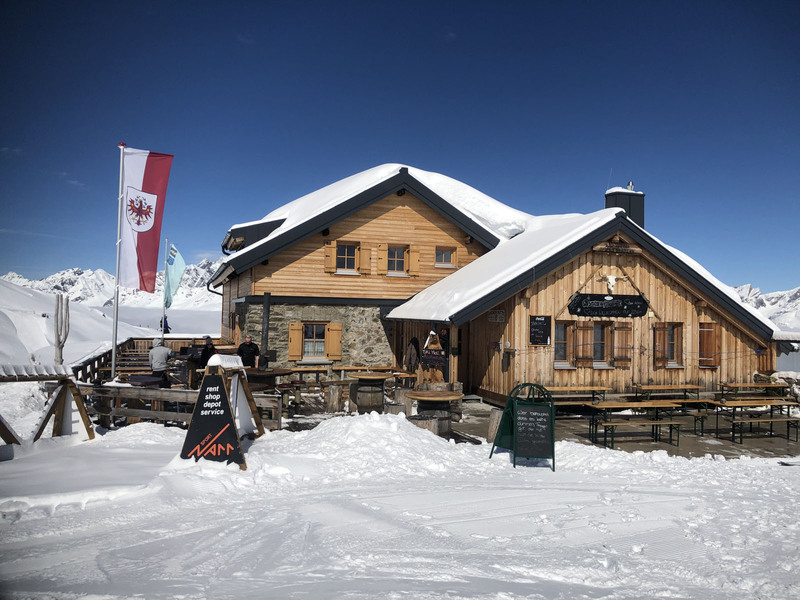 Ascher Hutte is a charming chalet restaurant at the crest of a peak below the gondola summit, follow trail 12c and signs to Ascher Hutte. 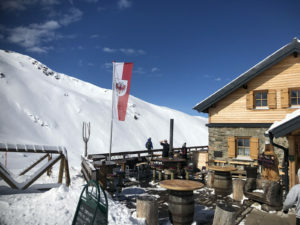 Lunch here is traditional homemade Austrian fare in classic hut ambiance. 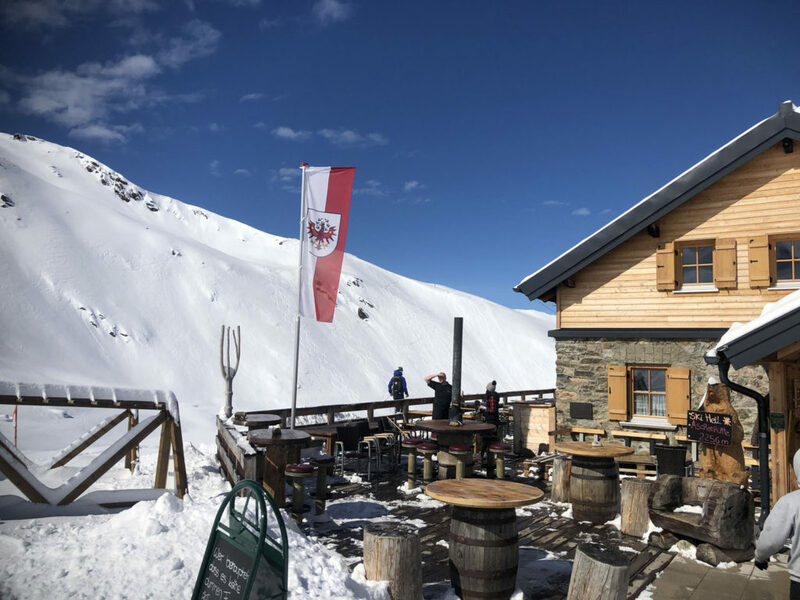 We dined on Grosti – a yummy crock of warm potatoes, bacon, melty cheese with egg on top, and Wiener schnitzel served with cranberry sauce and fries. 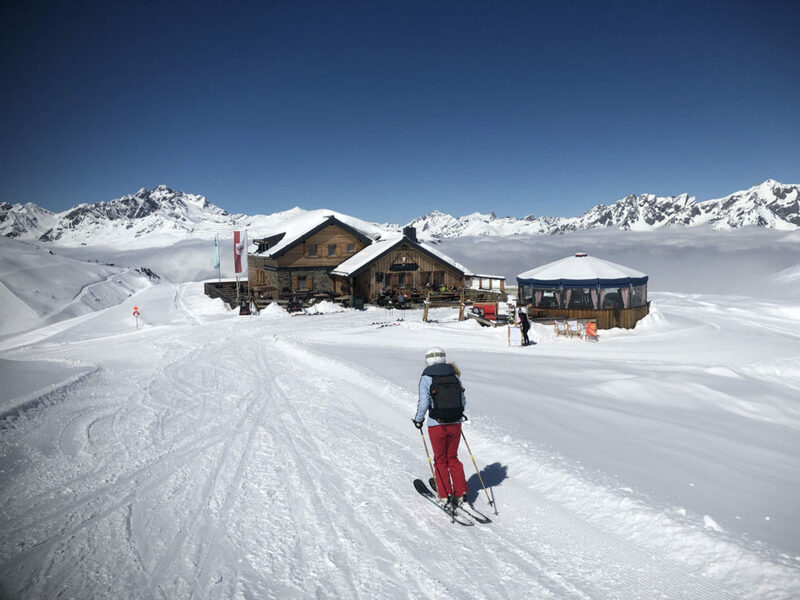 You can dine inside the cozy hut, or outside with fabulous Alps views of where you’ve skied at See in the sunshine. A beer or Austrian wine in Ascher’s Umbrella bar here would be lovely, but we had too much to ski at See. 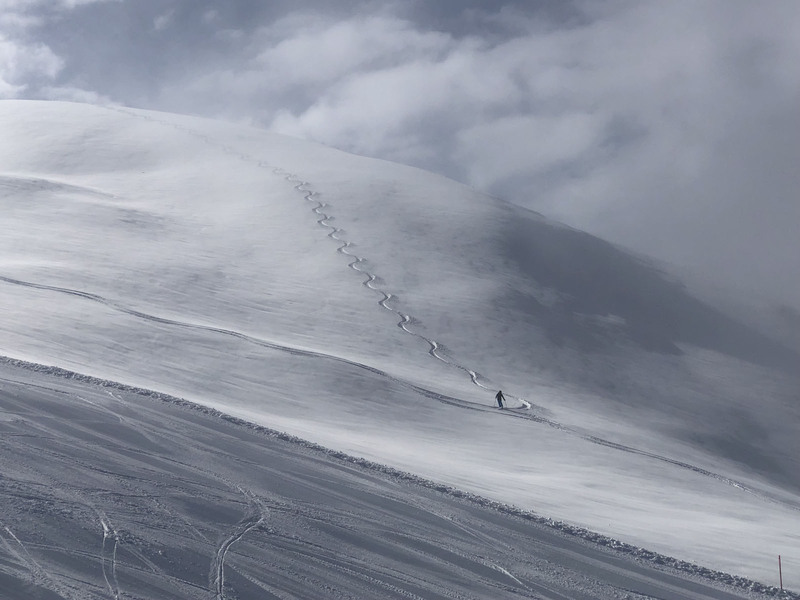 See’s long ski trail #1 winds back and forth at the end of the day to the village of See. 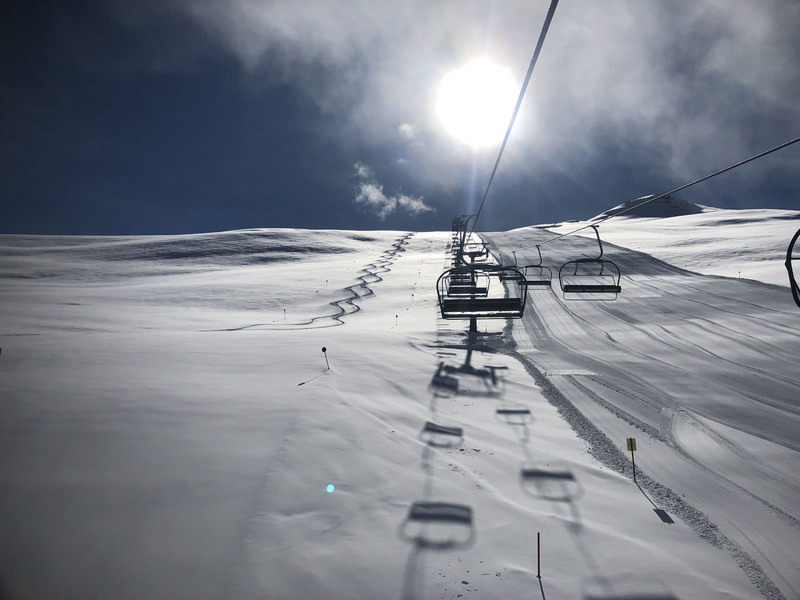 Or you can download the Medrigjoch gondola, which might be prudent on a busier ski day, or in spring when the snow becomes too warm at lower elevation. 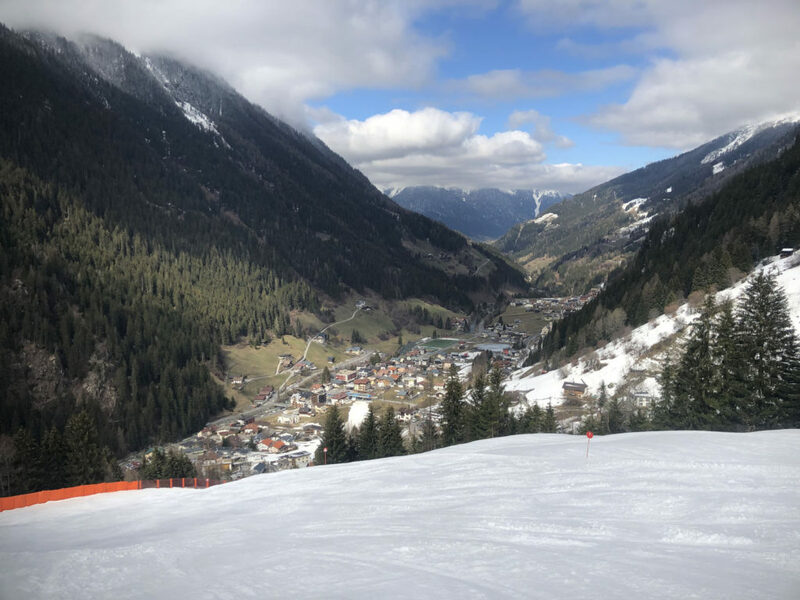 From See you are near more great Tirol skiing, Serfaus Fiss Ladis ski region is just over the mountain range. 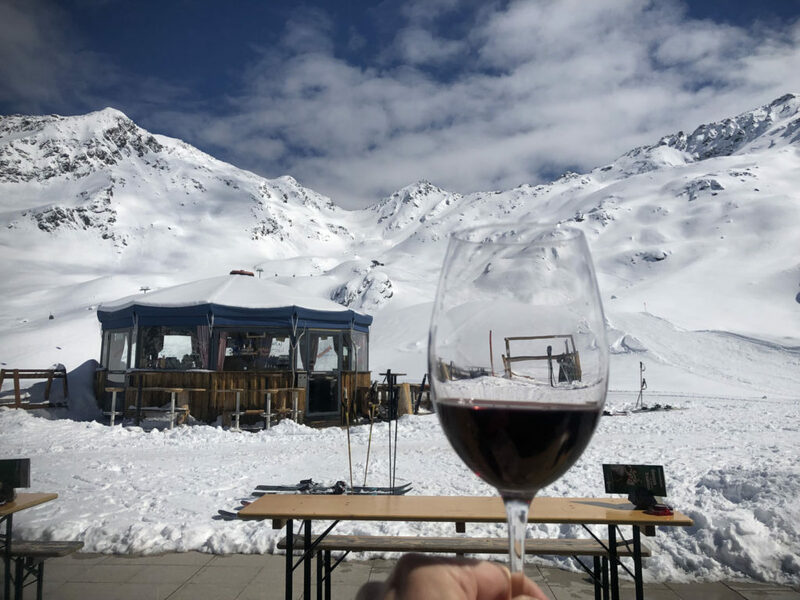 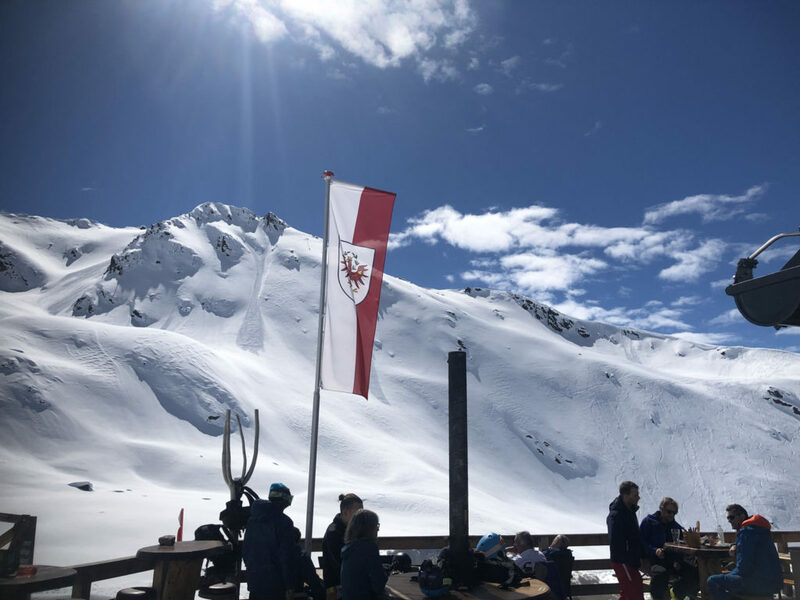 See is also close to Kappl and Galtür – two other day ski areas in the Paznaun ski region, and the biggest ski resort– Ischgl. 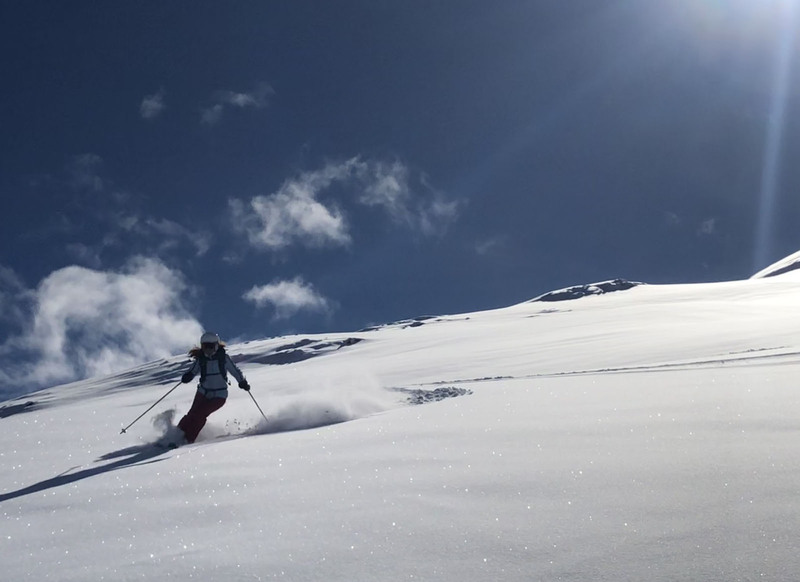 See is a fun ski area for the family, and a bonus on a fresh snow day.